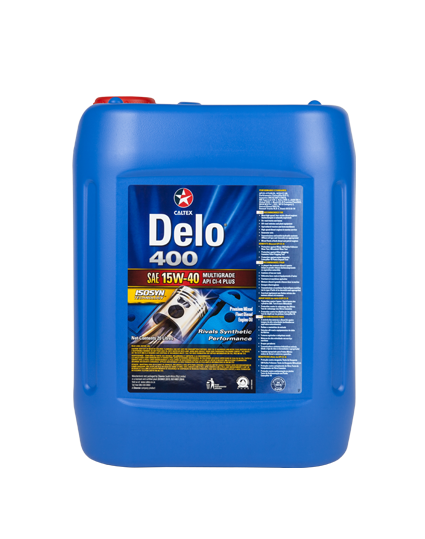 Delo® 400 Multigrade SAE 15W-40 is a high performance heavy-duty diesel engine lubricant formulated with advanced ISOSYN® technology and specifically designed for a wide range of diesel and gasoline engines requiring an API CI-4 PLUS, CI-4, SL, ACEA E7 or JASO DH-1 performance lubricant. Exceptional soot dispersancy keeps fuel soot in suspension, avoiding filter plugging, cylinder head sludge, abrasive polishing wear and oil thickening. Excellent deposit control on valves and piston crownlands reduces oil consumption. Exceptional oxidation stability and soot control extends oil drain capability so that equipment is in service longer generating revenue. Outstanding valve train wear protection maintains fuel economy. High level of anti-wear additive protects against valve train wear and scuffing of highly loaded parts operating under boundary lubrication conditions.